Our ancestor (First generation Sudo Yujiro) launched his own pottery (Sudo gama) at Sayado Mashiko machi at Meiji era (1868) who used to work as a craftsman of Jishoji-yaki in Gunma prefecture. 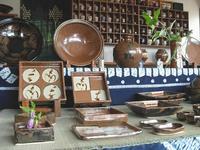 At the time of Second generation of Yasutaro, Sudo gama became one of the biggest pottery and had a lot of craftsmen. Also, around this time Hamada Shoji (one of the most famous pottery artist, and Japanese human national treasure) launched his own pottery at Mashiko. 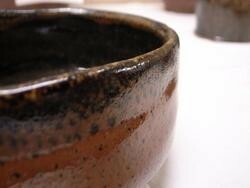 Thanks to his effort, Mashiko yaki had changed from an ordinary practical item, to an artifact. The third generation Sudo Takeo learned from Hamada Shoji. The son of Hamada and Takeo was classmates and Hamada had known Takeo since he was childhood, and Hamada helped to make his new private kiln in front of Hamada house. By taking advice from Hamada, Takeo made a bunch of masterpieces. 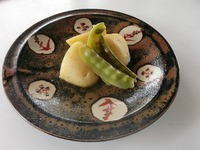 Nowadays Fourth generation Tagami Isamu and Fifth generation Tagami Munetoshi they are creating traditional Mashiko yaki. It is in front of gallery. on the south side of "Sankokan"
kaki-yu(persimmon-glaze)aka-e(red painted)vase 3rd generation TAKEO SUDO presented this to Princess Masako.